Published by Hodder and Stoughton Limited, London. First published in 1958. Size: 210mm x 145mm. 127pp total. Including black and white photographs (8 pages) and line art illustrations for 67 fish species. Hardcover with colour dust jacket. Arthur W. Parrott wrote four books on Fishes. 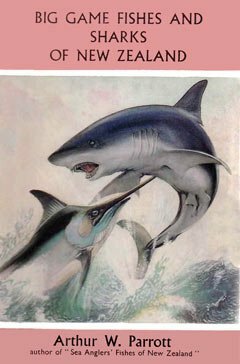 The first was Sea Anglers’ Fishes of New Zealand 1957, Big Game Fishes and Sharks of New Zealand 1958, Sea Anglers’ Fishes of Australia 1959, The Queer and Rare Fishes of New Zealand 1960. Though dated, these books are still very interesting to read. Parrott was a contemporary of David H. Graham, a scientific observer and investigator who did considerable research on the subject of New Zealand marine fishes operating from the Portobello Marine Research Station in Otago Harbour. Parrott mentions Graham in his books though I am unaware if they corresponded. From the dust jacket, “Its main purposes are to supply the formation that will enable the average person who has no specialised knowledge of ﬁshes to identify correctly the larger Game Fishes and Sharks of New Zealand and to give brieﬂy some general information on their habits, life-histories and distribution. “This is a reliable guide to the ﬁsh which are of greatest interest to the sea angler and the underwater hunter. No fewer than ﬁfty-six different kinds are included and each is accompanied by a good illustration. There is an introductory section which explains how standard measurements are taken and also a glossary of scientiﬁc terms. 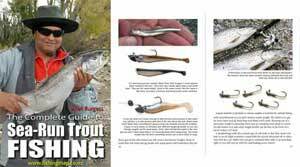 The book is not intended for the ichthyologist, but it provides the angler with just the details he needs on the identiﬁcation and general biology of each species.” The Times Literary Supplement. “Such is the skill in exposition of the author, one reads on with great enjoyment about the many spectacular ﬁsh which inhabit the waters around New Zealand.“ The Sphere. “This reliable, popular guide is admirably suited to the needs of the ordinary person.” The Times Educational Supplement. “The sea angler will have no diﬁculty in identifying a ﬁsh unknown to him from the illustrations and descriptions in this interesting and authoritative guide.” The Christchurch Star-Sun. “This well-written and generously illustrated ‘book will prove invaluable.” Sheffield Telegraph. Arthur W Parrott was educated at Christ’s College and Canterbury University College, Christchurch, New Zealand. ln 1928 he was appointed by the North Canterbury Acclimatization Society to investigate the food and growth of trout in Canterbury rivers and lakes. In 1930 he was appointed Biologist t0 the then newly-formed New Zealand Freshwater Research Committee. Joining the armed forces in 1939 he served in Egypt and on his return to New Zealand in 1943 he was invalided out of the army. of parasitic wasps for a number of Commonwealth and State Departments and Museums in Australia.